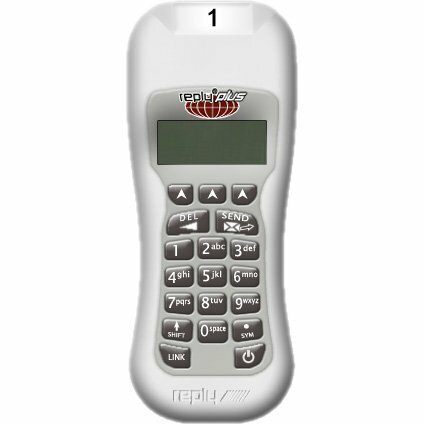 Wireless Audience response keypad featuring 2.4 GHz, Spread Spectrum, Frequency Hopping RF technology. Powered by two AA batteries. Works with WRS970 and WRS971 transceivers. Dimensions: 5.25 in. L x 2.2 in. W x 1 in. H.
Weight: Less than 3.1 ounce (add 1.6oz for 2 alkaline AA batteries. 2 line liquid crystal display (LCD) echoes user entries and displays messages from the Base Station. Reply Plus is designed to operate in an indoor area 650 x 650 feet at maximum power level. 500 keypads per transceiver channel identity. Battery life is ~100 hours, depending on usage or battery shelf life, whichever comes first. 2 year limited warranty, factory parts and labor. Please call or specify channel and keypad number in the notes during checkout.